Look at you and your fancy new Hollywood Hills home! I wish I could move to L.A. and live in this sweet rental. Here's your chance to live it up in the groovy, swinging, Hollywood HIlls where each day you can take in an awesome view of the Los Angeles skyline and laugh at all those peasants who live down below. It's easy enough to be done; this sweet rental boasts a panoramic view of the city direct from its rooftop deck where you can pop open a cold one and watch the sun set in the city of broken dreams. 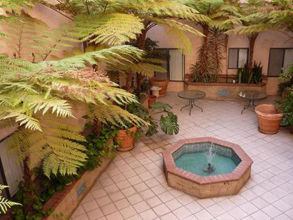 This 54 unit building also receives it's 5-Stars for a lovely fountain in the courtyard, roman columns, and not just one, but two full baths. Ryan Seacrest, and, of course Henry "The Fonz" Winkler both live in the area. Image going to your local store for a some butter and lamb chops (this sweet rental is in walking distance to stores, restaurants, and coffee shops) and running into fellow Hollywood Hills resident, Tori Spelling! Yeah, with all the plastic surgery she looks kinda of funny in real life, doesn't she? Only you and her other Hollywood Hills neighbors would know that! If you happen to befriend Tori Spelling, invite her over to your brand new sweet rental and have her admire your hardwood floors, ceiling fans with every lightening fixture, balcony, and of course, coat closet. Why not make Tori Spelling dinner in your full-facility kitchen and bask in the comfort of your sweet rental's climate controlled A/C? You can even suggest that she's welcome to move into the second bedroom -- in this 2-bedroom apartment -- if things happen to go sour with her hubby, Canadian actor Dean MCDermott. And yes, she can bring her cat because pets are welcome at this sweet rental. To see other Sweet L.A. Rentals click here.